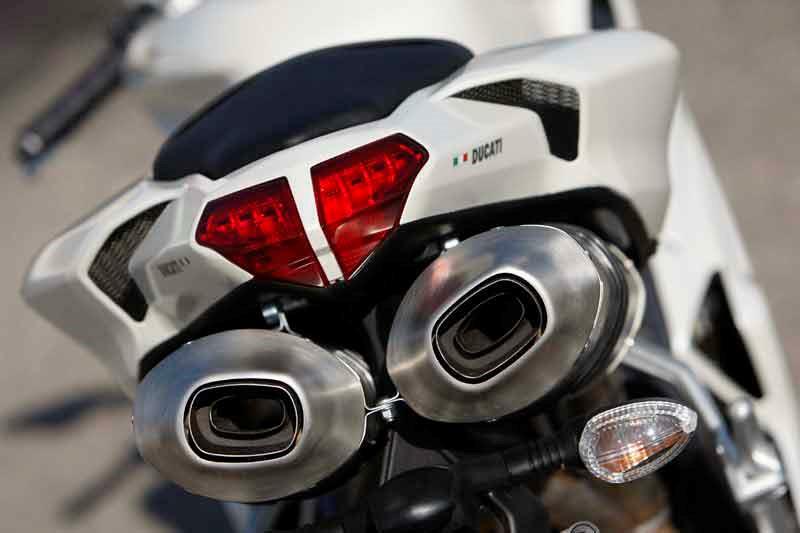 The Ducati 848 isn’t just a small 1098, it’s much more than that. The 848 is a proper fast (top speed is 166mph), fine-handling, gorgeous Ducati superbike in its own right. It’s no longer the poor relation to its big brother, like the 748 and 749 used to be. Although the more powerful 1098 is faster in a straight line and around a track, in the real world the Ducati 848 is every bit as fast. 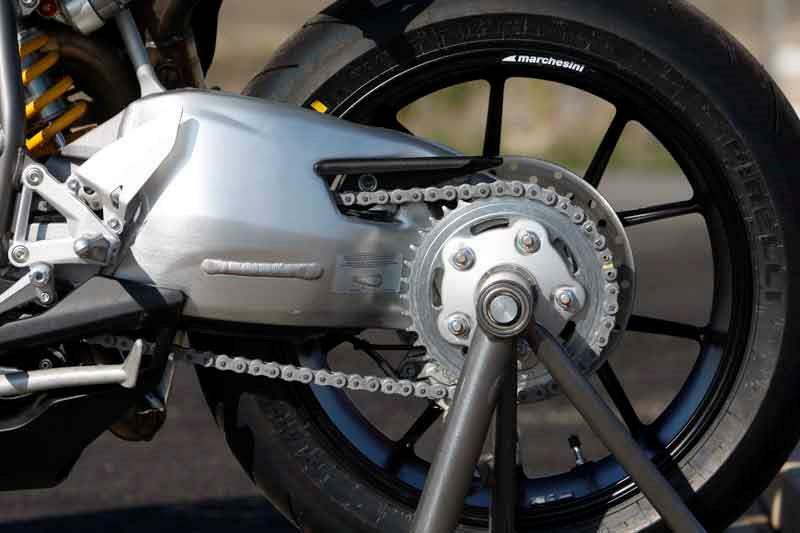 Chassis-wise the Ducati 848 is almost identical to the 1098, save for slightly lower-spec, but still fully-adjustable, Showa forks and Brembo radial brakes. These cheaper units don’t harm the 848’s performance through the bends one bit though. 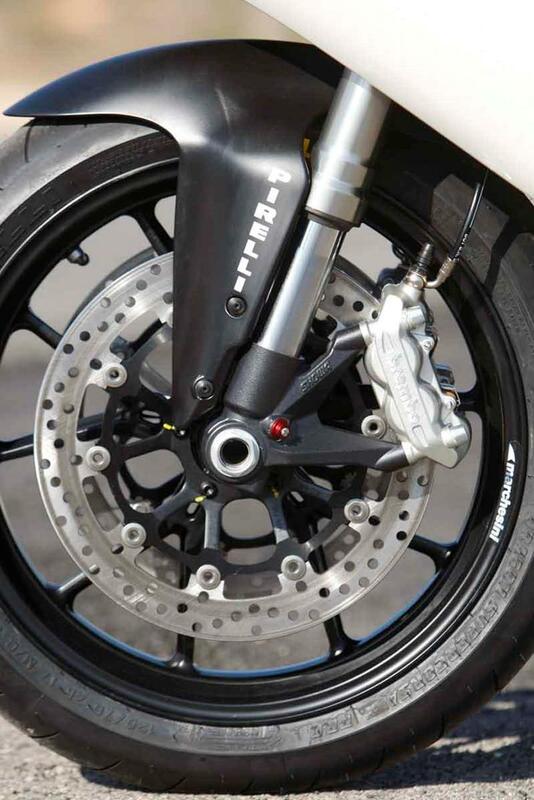 Most significantly the Ducati 848 has a half-inch narrower rear wheel and a 180-section rear tyre, which gives the 848 greater agility and lighter steering than its bigger brother. In true Ducati superbike style the 848 is rock-solid stable in the corners, at the expense of slightly slow steering through flip-flop chicanes and very tight hairpins. The liquid-cooled Desmodromic, 849cc V-twin Testastretta (Italian for ‘narrow head’) engine was designed and developed specifically for the Ducati 848; it’s not just a cheaper, sleeved-down version of the 1098’s motor. Making a true 122bhp and 66ftlb of torque at the rear wheel the Ducati 848’s motor is not only is very strong, but the power delivery is super-smooth and very linear, too. 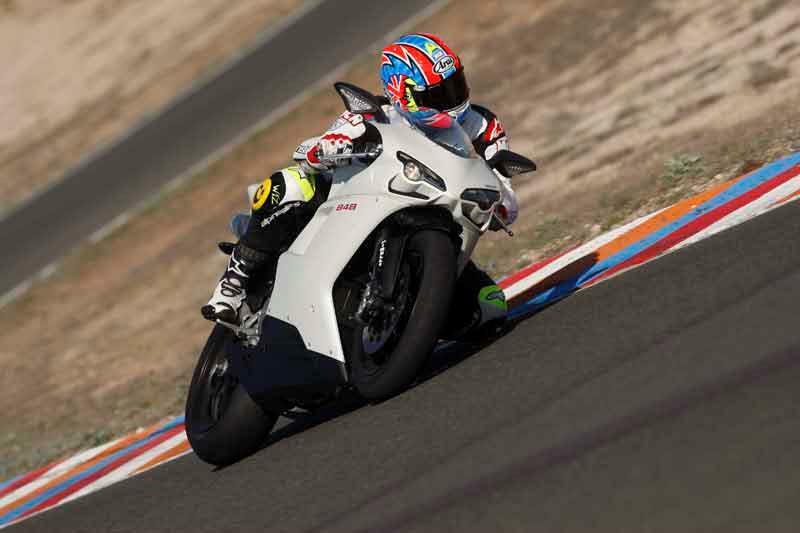 Compared to the 749, the Ducati 848 makes 20bhp and 10ftlb more, while weighing almost 30kg less. Modern day Ducatis don’t tend to suffer the electrical and mechanical maladies they used to, and like the 1098, Ducati has slashed servicing costs on the 848. Build quality is top notch, from the deep pearlescent paintwork to the high-end components used throughout. The Ducati 848 isn’t cheap. You’re undoubtedly paying over the odds for the badge on the tank, but on the other side of the coin depreciation is lower than a Japanese superbike. But expensive as it is, you do get a lot of beautiful, exclusive Ducati motorcycle for your money. Find a Ducati 848 for sale. Although an expensive used buy you are getting a very high spec motorcycle. 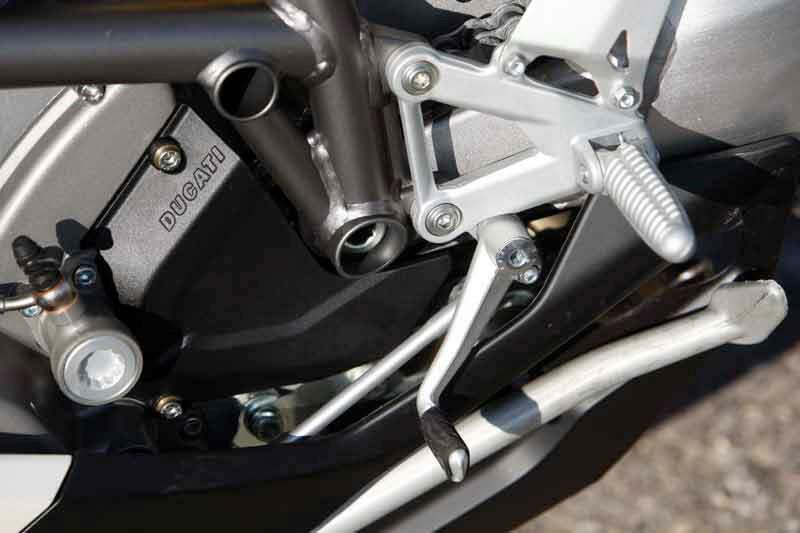 The Showa rear shock is the same as the 1098’s, a chunky single sided swingarm and a multi-function LCD dash, which is a replica of the unit used on Casey Stoner’s MotoGP Desmosedici. 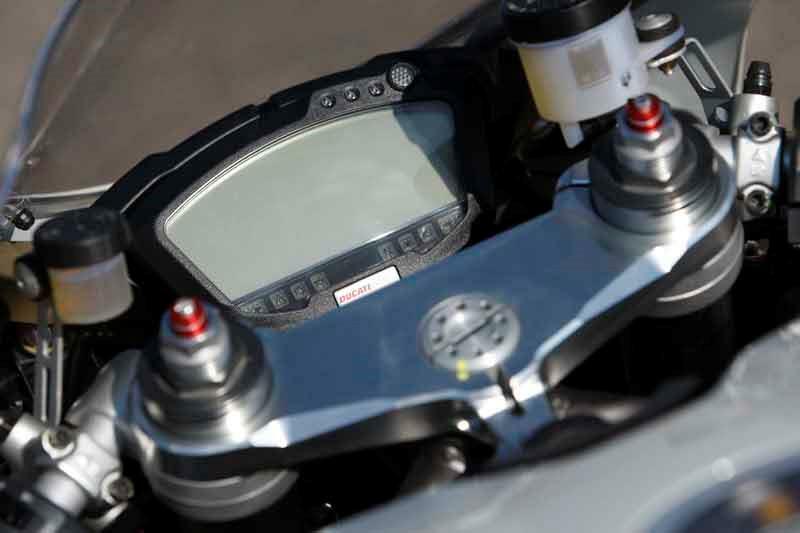 Options include the Ducati Data Analyser (DDA), which is an on-board plug-in datalogging system, that records lap times, throttle position, engine speed, engine temperature and distance travelled. 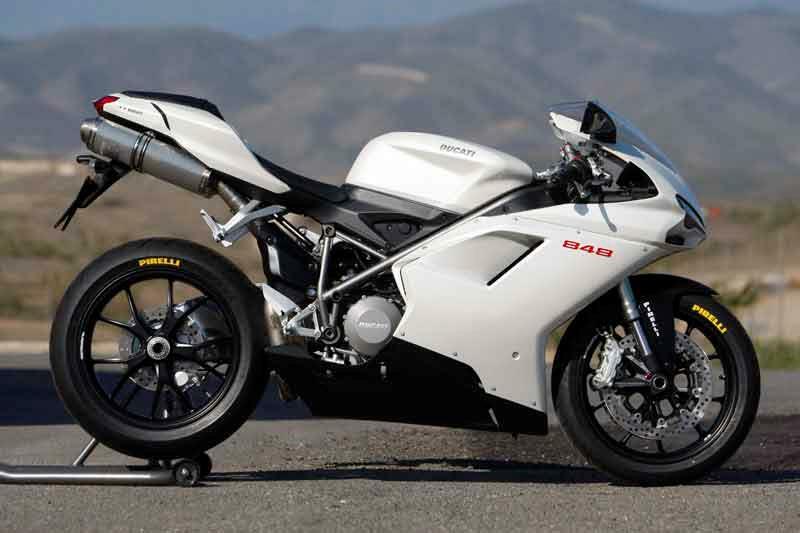 6 owners have reviewed their DUCATI 848 (2007-2013) and rated it in a number of areas. Read what they have to say and what they like and dislike about the bike below. Absolutely faultless, an amazing, user friendly bike. Handles like a dream. Just point it into a corner and it goes where you want. Brembos are amazing. Just enough power and a flat torque curve, no surprises. Keeps up with any litre bike down any A road. I've had two in the last five years and both totally faultless. Great build quality , it just feels solid and reliable. The value has only dropped 1800 in over 3 years of ownership. Servicing costs are much cheaper than most people think. No electronic rider aids but you don't need them, it's so forgiving. Bought it from Italia moto in Lincoln, and always go there for servicing, not the cheapest but very professional. Handling, performance, comfort, glorious sound and pretty all very much up there. Let down only by fuel consumption and a small reliability issue. Rear wheel bearing badly worn after only 3500 miles. Otherwise brilliant. Running costs quite high for a low mileage machine. Slightly more expensive to buy next to the opposition. Failed first mot with rear wheel bearing worn and only 3500 miles on clock :( very expensive repair/replacement of hub. Dealer purchased demo bike. £9.5k in April 2013 with 1200 miles on clock. Not enough superlatives for this bike. Stunning to look at, stunning to ride. I went from a cbr600rr7 to this and I thought that handled and went. Bought an 09 from KJM superbikes with 750 miles on for a huge saving on new. Had to get back to a twin after 12 months of riding a 600 four, missed the torque and the oomph out of the corners and blimey this bike does not disappoint. Can't wait to get out again if the weather will ever let me. right first off I love this bike,everything about it has refreshed my love of bikes.I have rode a few different bikes over the years (a cbr1000rr being my last bike) but I havent had so much fun in the corners since the days of my trusty old nc30.This bike handles like a 600 but with a hell of a lot more grunt.There is a few things that need done to this bike to make it better(did I just say that lol), firstly the seat...or lack of it. yes I know its a full sports bike and this helps you feel the feedback but dam its hard on you the first few times you ride it, it also catches you out when you grab a handfull of the sweet brembo brake system and your launched sliding into the tank with a force that will leave you infertile for a few weeks. this can be fixed(slighty) with the ducati Neoprene Race Seat which stops you sliding about and is slightly softer on the rear. next on the list is the rear hugger,or lack of one.ok most owners probably will never have it out in the rain and mud but everything gets thrown into the back of the engine.lastly the handling.......needs a stearing damper if your the type to push in on a bit on the bumpy roads and the rear end is far too hard! each bump throws you out of your seat if your a light rider like me,13 stone with all my gear on.I checked the rear sag and its set at 12mm of movement!! A lot of owners put an ohlins rear shock on with a 1098 ride height adjuster as they cant get enough adjustment from the standard showa kit.once these things are done then your laughing.when I had the blade it was a great bike(maybe spoiled me with its handling) but I was getting bored with the point and shoot superbike after the fourth year of our relationship.I had origanlly wanted a 1098 after a run in one but the costs were out of my range so I took a 848 out for a run.....wow..... its not a mini 1098,its a totally different bike.Its a better road bike than the 1098 like the 1098 is a better track bike than the 848.One of the loves from this bike is the way the power is delivered and the note from the engine in the higher rev range, tucked behind the screen im grinning from ear to ear.roll on the twistys. A superb bike with its own identity. Plenty of performance, great styling and desirability. No reliability issues to date and affordable servicing. As to the 848 'looking Japanese' - Laser eye surgery is available for those suffering from cataracts.... Highly recommended, in red or white and a credible alternative to the GSXR 750. Only just getting it run in so not yet fully stretched its legs but fell in love within 10 miles on the test ride. More comfortable and smoother than the 748 - good looking bike, although I've had a Ducati rider tell he thinks it looks Japanese (!). Biggest problem is the white or the red. I've got red. Great bike if a little expensive compared to its peers.